Sparta Engineering is pleased to offer the following line of spreader bars available for commercial use. This list is constantly growing as we add new sizes and styles to the list so check back for updates. Why choose our spreader bars? Interested in becoming a reseller? We are always looking to expand our distribution network. If you would like to be set up to resell these bars please contact Jason@spartaengineering.com. This is a basic telescopic spreader bar. The end connection remains simple with a solid plasma cut steel double holed single lug. The pin is mild steel and there are no special treatment for sliding. Each spreader bar comes powder coated safety orange and with a permanently affixed rating plate. The design is in compliance with ASME B30.20 & BTH-1 and construction in accordance to CSA W59. Each bar comes with an Engineered stamped loading diagram and certified weld inspection. This is the most economical way of suspending a load. This style of spreader bar excels at heavier lifts. It has a pivoting end lug which rotates in order to reduce the bending moment put into the spreader bar effectively improving the life of the unit. The rollers available on heavier models also make it easy for one person to extend or collapse the bar. This bar commonly has high tensile pins and end lugs in order to keep the bulk of the equipment down. This class of spreader bar or spreader beam encompasses a fixed length bar with multiple hook points. The low profile design of these spreader bars make them excellent for indoor use where hook height is severely limited. They are also commonly used in tandem crane lifts where the spreader bar is used to facility two cranes lifting one object. Their comparatively small span makes it possible for these beams to have a high capacity and their simplicity keeps the cost low. Sparta Engineering offers several zero weld options which eliminate the need for annual weld inspection. A cost savings of more than $5000 over the life of the bar. Ready to manufacture a spreader bar? 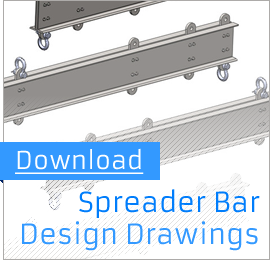 We offer spreader bar drawings and specifications for manufacturing a Sparta spreader bar. Send us an email for pricing.